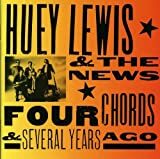 Huey Lewis & The News', "Stuck With You"
All the same friends, and the same address. He pronounces "address" as uh-DRAY-ess. Worst pronunciation ever. Back in the 1980's, it was years before I had a clue what the line was!